When I first bought a UPS, there was often not much discussion in regards to sine wave, power factor, compatibility, or much of anything else. In fact, my first UPS was a pretty dumb unit with no mention of any of that, just a box that beeped when the power went off. Ultimately, most of the consumer-grade UPS from before this time period output what they called “modified-sine” power. Essentially, instead of a smooth curve, it’s like a digital approximation of a curve,showing up as hard lines on a scope as opposed to the smooth 50 or 60hz curve you’d expect from the wall. All of the sudden – that power factor correction does matter, because now your modified-sine UPS no longer works! Typical symptoms include anything from working sporadically, to immediately tripping the UPS into overload. 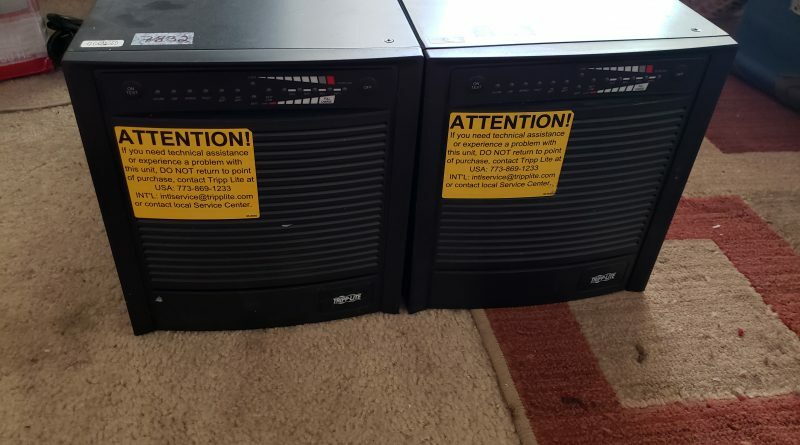 Over time, I started phasing out my older UPS for the newer, true-sine UPS, of course with the ability to generate a clean sine wave – the price goes up. All was well, for now. With these true-sine UPS, most anything should just work. However, these UPS do still have one slight difference from just running of the wall power: they still switch between the line and battery, despite the inverter outputting a pure sine wave, this switch does still happen, albeit very quickly. It also means the voltage and any interference, will also switch – to what was coming from the outlet – to what is coming from the inverter. Why does matter? Well, for most things, it probably doesn’t. For your typical PC at home, it’s often going through an AC->DC switch mode power supply and being converted to something else entirely, so a little voltage sag on the input side means nothing. What about for a life support system, though? Or, an AC motor, that may actually slightly change speed based on differences in voltage, phase, etc. I never even had the thought until I started seeing issues with pump performance based on AC voltage. In this case, AC voltage sag during the day, when my air conditioner was running, would actually result in my skimmer pump performance drop dramatically. My immediate thought was – well I can just put it onto a UPS and that should fix it, right? Well, half-right. All of my UPS were standard, switching-style UPS, they only run off the inverter when they need to, meaning that sagging voltage isn’t going to cause the UPS to switch on, unless it drops below it’s low voltage threshold, in this case, 90v and triggers it’s brown-out correction. My voltage sag was no where near that bad – only 5v or so at most, so the UPS had no reason to switch to battery. Up until this point in time – I didn’t even know there was another option. It turns out what I wanted, does exist. They call them “online” or “double conversion” UPS. And like the name suggests – they run off the inverter, all the time. Not only do these not need to switch in the event of a power outage – they essentially act a bit like a power isolator, what comes in and what goes out are essentially, two different things. Many of them also support switching, often as an “energy saver” function, as running the inverter all the time does mean you are consuming slightly more power. However, the potential benefits are significant, if they’re needed: no switching and total isolation. It no longer matters if my air conditioner is running or not. The UPS puts out clean 120v regardless. I’ve seen the occasional PC reboot when a UPS switches to battery – it often proceeds to function fine after that. Of course – not very useful for preserving your work at that point, but this is the type of thing an online UPS would laugh at. In this type of situation – the power itself was likely okay in terms of sine wave/voltage, etc, but the UPS simply didn’t switch fast enough for the computer to stay happy. The big reason I think we don’t discuss these more is cost. This is the kind of UPS a hospital would put on a heart machine. Actually, I take that back – that one would cost even more for being “medical grade.” Though for our non-life-saving intentions, they often cost 40-50% more. My solution to that? eBay. You can usually buy them with dead or no batteries, and pickup a set of batteries online, often all-together at less than half the new price. Despite the higher price, I wouldn’t say that they are bad value. On the contrary – the opposite might be true: in general, they are more true to rating than non-online/switching UPS. For example, my 1000VA-online Tripplite SU1000XLA supports 800w total load. My 1500VA-non-online/switching CyberPower CP1500PFCLCD supports 900w. An extra 500va yet we only get 100w more watts? Quite simply – double-online UPS have to be more efficient, because they run off the inverter all the time. That said – they are much more true to rating, and where you used a 1500VA regular UPS, you may only need a 1000VA double-online. This has often been my experience anyway. The best way to tell for sure is to just ignore the VA rating entirely and just go off the max wattage. So where does that leave us? Ultimately, modified-sine UPS are becoming less and less useful as time goes on, true-sine UPS are good enough for most of us, and “online” ups are for people with mission critical/sensitive equipment that can’t tolerate any sort of switching, voltage sags, or interference. Of course, there’s a lot more to cover, as you get more into higher-grade switching, online and commerical UPS, you start to get remote management features, load/bank switching, and other such features. I’ll save some of my adventures with that for part 2: TrippLite Online UPS and the SNMPWebcard.